mothermade: I am mother. Hear me roar! I am mother. Hear me roar! A year ago, my son lost his most treasured possession, a small Gap Hopper simply named “Bunny” at the Nick Hotel in Orlando. And with Bunny’s disappearance, I realized that I had allowed my professional life to eclipse my family life. At the end of our stay, I was too busy refining my course syllabus to make the final sweep of the hotel room. 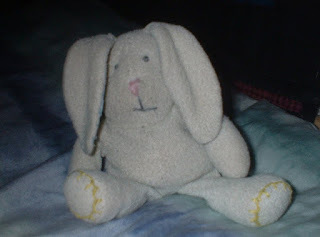 I had my first class meeting the next morning at 9 a.m.
Irreplaceable, Bunny continues to come up in conversation. “He won’t know where to find us when we move.” “He’s never seen Wisconsin.” Now, his younger, yet bigger cousin, Bunny #2 keeps vigil. Insensitive, I grew up telling her I would never marry, let alone have kids, and that I would live the hopping life of a New York journalist, driving my BMW and writing for the Rolling Stone. How that must have hurt her. She had spent her life making mine better. When my son was born, I struggled with my immature feelings about being the young hot shot. But caring for him day to day became the most gratifying job I’d ever had. And when my mother died during my son’s eighth month of life, a part of me felt I should give him what she had given me. During the funeral, my sister told me that our mother felt that I had honored her by following in her footsteps. But the struggle was only suppressed. I eventually became an adjunct professor, a freelancer and an AIGA board member in Virginia. But remember Bunny? Mommy took a back seat. Recently our move to Wisconsin allowed me to step back and re-evaluate the past year. The loss of Bunny will forever remind me of my inadequacy in my position as mother. I tell myself daily that will never occur again. My children are growing up, and each day brings a new revelation. Last night at 1 a.m., my son came into our room. He was frantic. Bunny #2 was lost. We searched the entire house until 2:30. At which point, I could not sleep. Where could he be? We would not lose another Bunny. Not under my watch.